Hair Dyes are used to split gorgeous over you. It gives you a completely different look with a new attitude. Some are used to cover grey hair while some merely as a style quotient. Talking about the Indian market, people in this sub continent normally have black or dark brown hair and yes! Looks very good on the skin tone. But what is the harm in exploring and experimenting? Burgundy, plum, daring blue, greens and reds are fast gaining popularity. There has been a tremendous flow of some of the most reliable and trusted hair dye companies. Today let’s discuss about some of the most marketed top hair dye companies in India. Have a look! Garnier, owned by L’oreal has the best line up of hair colors in the Indian market. The company aims for healthier and well nourished hair with its oil powered permanent colored technology. Active hair care ingredients like grape seed and avocado oil is used to offer long lasting color and shine. It has recently come up with a foam technology that nourishes hair from within. 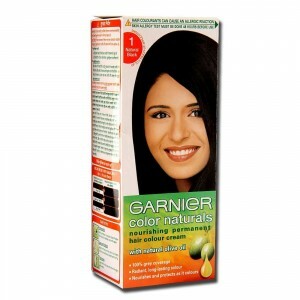 Garnier Color Naturals is available in different variants such as vibrant color for dark hair, nourishing foam, oil powered permanent color etc. Sub brands include Nutrisse, Nutrisse Ultra-Color, Nutrisse Nourishing Color Foam and Olia. Revlon another most reliable hair dye brands available in India. The products are found as gel concentrations, powders or simply as readymade solutions. They also have a range of effective after dye shampoos so that the color does not fade away quite easily. They are easily available online and also in shops. 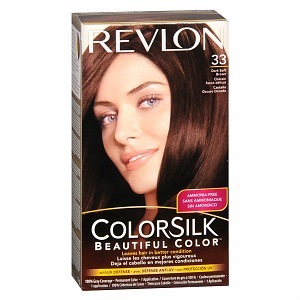 Revlon Hair color is available in categories such as Highlight, Frost and Bleach. You may also find them in variants such as Luminista, Frost & Glow, Luxurious ColorSilk Buttercream, Root Erase and so on. Wella Kolestint Hair Color is intense permanent hair color foam that gives a long lasting and nourished hair after every dye. It has a no drip, no mess formula and is perfectly fine for grey coverage. It is very easy to apply without creating any mess around. Wella comes in 18 gorgeous shades of Black, Blue Black, Dark Brown, Violet, Medium Brown, Burgundy, Light Brown, Intense light Golden Brown, Exotic Red, Dark Blonde, Chocolate Brown, Cherry Red, Medium Blonde, Volcano Red, Special Light Ash Blonde and so on. 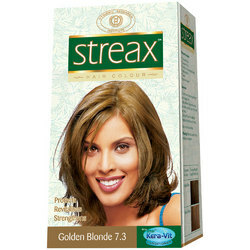 Streax Hair Colour is one of the best hair colors in the Indian market. It is considered the safest dye that not only gives vibrant colors but also effectively repairs damaged hair. This revolutionary hair color has unique properties that strengthen the roots from within. They offer a very rich spectrum of shades to suit every skin tone. Streax is easy to use and the silicone active system offers a break-through blend with dual cationic polymeric conditioning. Various color variant offered include base shades, brownies, plum & cherries, coppers, blondes, colour cutters etc. Godrej Hair Colour with its innovative colour lock formulation is enriched with the goodness of vital herbs for hair nourishment such as Gotukola, Nelli and Aloe Vera. It is price friendly and is available in both powder and liquid packs. It is enriched with double conditioning formula of aloe and protein extracts to give a permanent shine to your hair. 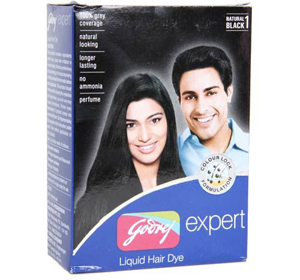 Hair colour from Godrej is available in three shades viz. black, brown and burgundy. 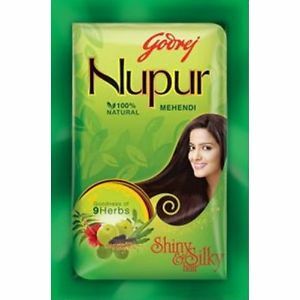 Products include Godrej Expert Original Powder Hair Colour, Black Henna, Abha Herbal Black Henna, Renew Permanent Hair Colour Cream, Advanced Powder Hair Colour etc. 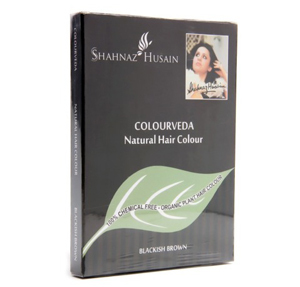 Colourveda by Shahnaz Husain is an herbal hair color range that offers the goodness of Ayurvedic ingredients like henna, amla, brahmi, shikakai, bhringraj and majeeshtha extracts. It acts as a deep conditioner for the hair and promotes hair growth. The added catechu and indigo natural colorants conceal grey hair and keep your hair young and fresh. This natural chemical free hair color smoothen hair, provide luster and deep nourishment. It is available in shades of blackish brown. 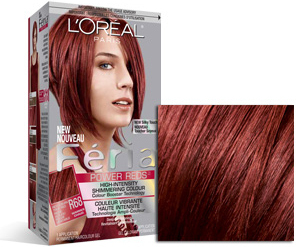 L’Oreal Paris is another top hair color brand marketed in India. The core of this hair product is that it is 100% ammonia free. It nourishes and strengthens hair roots along with offering deep lustrous color. This revolutionary hair color has unique properties that make you star of any show. 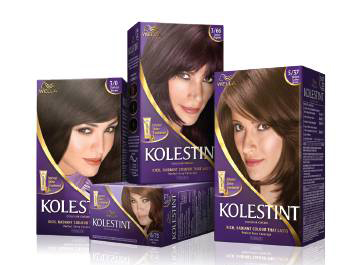 L’oreal Hair Colour is available in different such as Casting Creme Gloss, Triple Care Colour and Excellence Creme. Henna Hair Dyes is a popular non toxic hair color with active ingredient content such as natural henna, herbs and botanicals. It deep cleanses the scalp and keeps your hair stronger and healthier by promoting hair growth. The product is free of harmful chemicals, metal salts, peroxide or PPD’s. It is unique blend of henna and herbs creation is also FDA approved. This superb hair dye is 100% safe and is available in variant such as natural black, wine red, copper brown, dark brown, medium brown, light brown, ginger blonde, gingery-blush Blonde and many more. 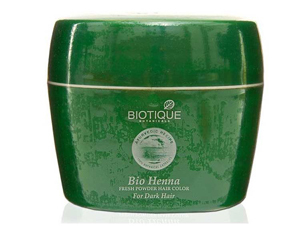 Biotique Bio Henna is one of the top marketed hair color products in India. It includes a natural blend of heena leaves, mango kernel bark of arjun tree all highly effective for dull and damaged hair. It nourishes hair from within and gives natural shine to the hair. It also acts as an active conditioner. It is easy to apply and creates no mess. However, the only disadvantage is that it makes the hair greasy and you would require shampooing from time to time to get rid of the greasiness. Also this hair color is effective on dark hair and does not much cover greys. If you are tired of hair loss problems post hair dye, you may browse through our collection of Best Hair Growth Oil in India. Thank you for posting this. I like to color my hair and my favorite brand is garnier. I started using Garnier hair color more than a decade back, i guess since 2002. But its very disheartening for me to say that over the last 4-5 years I have seen a considerably reduced quality been now produced by them. Although I was allergic to certain dyes, I had never been allergic to using Garnier products, but now after using the recent garnier products, i have got a lot of bad results….itching and scalp infection. In my personal opinion, L’oreal is far above and does no damage to your scalp skin. You can also use Matrix, Wella or Boutique products. But using garnier color is almost like using a cheap ammonia based dye…no matter garnier claim no ammonia but they have substitute some equally strong harmful ingredients… please consult a good dermatologist in case you want more prove from my above statement.